Under the State Innovation Models (SIM) initiative, launched in 2012 by CMS’ Center for Medicare and Medicaid Innovation (Innovation Center), CMS has awarded nearly $950 million in grants to states, the District of Columbia, and the territories to design, implement, and evaluate multi-payer health care delivery and payment reforms aimed at improving the quality of care and health system performance while decreasing costs for Medicaid, CHIP, and Medicare beneficiaries. The idea behind the SIM program is to foster and test the impact of reforms implemented by multiple payers in concert under a comprehensive plan developed by the state. Interest in testing multi-payer approaches to health care delivery and payment reform has grown in recent years, on the premise that initiatives that include multiple payers may have greater leverage to influence provider behavior and the health care system overall. The idea is that participation in an initiative by a critical mass of payers might strengthen the impetus and business case for practice transformation at the provider level because of the large share of patients covered by those payers. Administrative and reporting requirements on providers might be streamlined, too, if payers coordinate. CMS has pointed out that states may be uniquely well- positioned to lead multi-payer efforts because of their major role as purchasers of health care services (Medicaid, CHIP, and state employees) and because they may be able to use their convening authority to bring payers and other stakeholders together. CMS has also noted that state legislative and regulatory authorities may be needed or helpful to advance new models of health care delivery and payment. Under the SIM initiative, the Innovation Center has been making two types of grants to states. Model Design grants provide funding to states to develop or refine a State Health Care Innovation Plan – a state-level plan for health system transformation. Model Test grants provide funding to states to implement their system transformation plans and evaluate their impact. 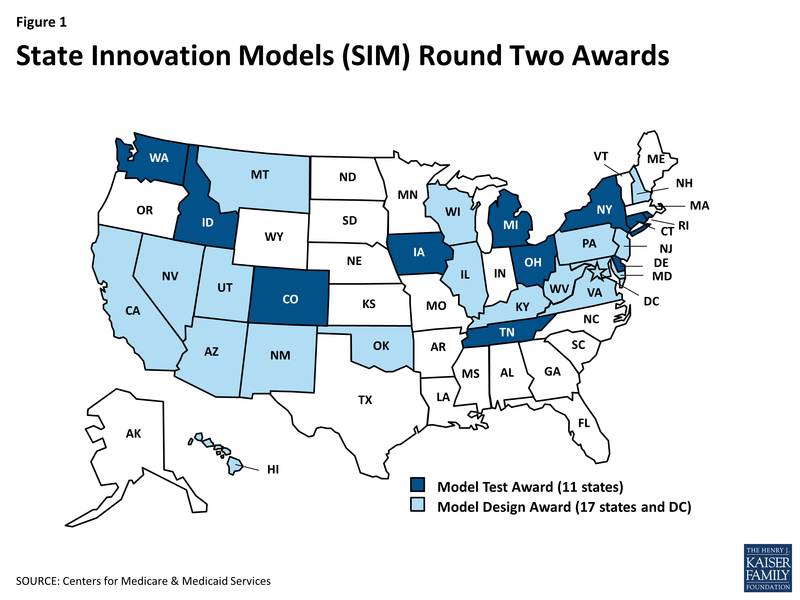 In February 2013, the Innovation Center announced a first round of SIM grants, awarding a total of $285 million to 25 states (16 Model Design states, 3 Model Pre-Test states, 6 Model Test states). An earlier fact sheet summarized those grants. An independent evaluation of the Round 1 Model Design and Pre-Test grants1 and a Round 1 SIM Model Test base year report,2 prepared for CMS, were released in May 2015. These reports largely focus on the implementation of SIM, although they include some early results related to Medicare and private insurance impacts. This fact sheet provides information about more recent grants awarded under SIM Round 2, with a focus on Model Test grants. In response to lessons learned under SIM Round 1, CMS modified the terms for SIM Round 2 in several ways. Under Round 1, Model Test awards ranged from $20 million to $60 million per state. CMS raised the ceiling on Model Test awards under Round 2 to $100 million per state, to accommodate larger, more diverse states that develop more complex plans, including region-specific efforts. Also under Round 2, the Model Design period of performance was extended to 12 months (from 6 months) and the Model Test period of performance was extended to 48 months (from 42 months), including a pre-implementation period of up to 12 months. In December 2014, the Innovation Center awarded more than $665 million in Round 2 SIM grants. Nearly $623 million of this sum was awarded in Model Test grants to 11 states, while $43 million was awarded in Model Design grants to 17 states and DC and three territories (Figure 1). The remainder of this fact sheet discusses the Round 2 SIM Model Test states, identifying key themes as well as similarities and differences among their approaches. The descriptions of state approaches are based on the project narratives submitted by the states as part of their grant application to CMS. As states move forward with implementation of their SIM plans, some elements, such as details of the payment models they deploy, or the payers that participate, could change. Progress reports submitted by states, as well as reports prepared by an independent evaluator, will document SIM implementation progress and include measures of SIM outcomes. All state SIM plans include Medicaid and CHIP, and all but one include public employees (Table 1). In many states, Medicaid and CHIP beneficiaries and state employees comprise a sizeable share of all state residents, which could give states substantial clout to influence health care delivery and payment. All states have also secured broad commercial payer support and participation. Medicare involvement appears to vary by state. Tennessee’s project narrative indicates that some MCOs have committed to including their Medicare Advantage lines of business in the state’s initiative. Some other states, whose SIM initiatives do not include Medicare, are adopting delivery and payment models that align with Medicare models such as the Medicare Shared Savings Program (MSSP). Consistently, states have stressed the importance of transformation plans and new models that are flexible and support the needs of different health systems and provider organizations, and that accommodate wide variability in organizational structure and size, readiness for transformation, populations and geographic areas served, and other factors. Both the Round 1 and Round 2 funding announcements encouraged states to take up and expand health care delivery models that align with other Innovation Center programs and demonstrations, including the MSSP, the Bundled Payments for Care Improvement initiative, the Comprehensive Primary Care initiative, and the Multi-Payer Advanced Primary Care Practice demonstration. Round 2 Model Test states are expanding these models as well as building on experience gained through state Medicaid initiatives, including patient-centered medical homes (PCMH), health homes, and Accountable Care Organizations (ACOs), and models in the private health insurance market. Comprehensive, patient-centered primary care is the foundation of most of the delivery system reform models in the Round 2 Model Test states (Table 2). Under PCMH-type models, patient care is organized and managed by care teams that may include physicians, nurses, pharmacists, social workers, and administrative personnel. Some states are engaged in efforts to integrate additional types of providers, such as community health workers, into primary care teams. Such efforts include training and certification programs as well as reimbursement for the services of these newer providers. SIM states are expanding and aligning PCMH initiatives across multiple payers. States are also developing or expanding Medicaid “health homes” for people with chronic conditions, including serious mental illnesses, under a new state option established by the ACA. States are using SIM funds to finance activities integral to practice transformation, including implementation of electronic health records (EHRs); provider education about and implementation of performance measurement; development and implementation of new clinic workflow and staffing models; and training in team-based care. A majority of the Model Test states are also incorporating (or plan to incorporate) ACOs – provider-led organizations that are accountable for quality and total cost of care for a defined patient population – into their blueprints for health system transformation. About half of the Round 2 Model Test states (CO, DE, IA, ID, and WA) indicated that telehealth is a key strategy for reaching patients in rural or underserved areas, especially complex patients with disabilities and/or chronic diseases, who have greater needs for specialist care. Several noted that telehealth is particularly important as a means for connecting patients to behavioral health services. To move in these directions, states are working to establish telehealth standards and develop policies that encourage the adoption and expansion of telehealth. Linkages between different types and settings of care are integral to the operation of more coordinated systems of care and value-based payment models (Table 3). Some states’ SIM plans envision moving beyond care coordination to care integration. For example, Colorado has mapped out a phased approach to integrating behavioral health care and primary care, beginning with coordination of these services and advancing to co-location of providers and, ultimately, fully integrated care delivery. A sharpening focus on quality and cost accountability and population health has spurred states, payers, and providers to think more broadly about the social determinants of health, including housing, employment, food security, and other factors. Most SIM states, in devising new models of care and care linkages, have explicitly addressed social determinants of health. For example, New York plans to use SIM funds to support the use of Public Health Consultants at the local level. These consultants will work with the SIM-created regional PIHPs and with provider systems to spread evidence-based clinical initiatives to improve population health, and also to support providers in connecting their patients to community and public health resources and services. In Washington, regional “Accountable Communities of Health” (ACHs) will be formed to coordinate activities and investments across health care providers and health plans, public health agencies, local government, social service agencies, and others. The idea is that greater integration of health and social services may lead to gains in population health. Two key principles that underpin the SIM initiatives are accountability for quality and cost, and population health management. States are using a variety of payment mechanisms to advance these principles and reinforce new models of care. SIM states are specifically required to pursue payment models that link reimbursement to value, moving away from paying for individual services and procedures and toward payment approaches that reward providers for care coordination, high quality, better health outcomes, and reduced costs. Under the SIM initiative, CMS has set a goal that 80% of all payments to providers be made on a basis other than fee-for-service (FFS), using alternative methods that link payment to value. The provider payment reform models outlined by the Model Test states lie along on a continuum, ranging from arrangements that involve limited or no provider financial risk, such as pay-for-performance (P4P), to arrangements that place providers at more financial risk, such as global capitation. Arrangements that involve greater provider financial risk tend to require greater investment in health information technology (e.g., EHRs) and data analytics capacity at the provider level, realignment of care processes, and provider participation in larger, more integrated delivery systems. States recognize that providers, practices, and other health care entities vary in their capacity and desire to take on greater risk and/or join more integrated systems. Accordingly, state SIM initiatives often involve different payment methods operating concurrently in different settings. States may work with payers and health plans to build consensus around core payment principles and performance measures, but leave payers and providers to define specific details (e.g., the level of shared savings, minimum panel size). The provider payment models outlined in the SIM Round 2 states’ project narratives (Table 4) are summarized below, ordered according to the degree of provider financial risk involved. Per-member per-month (PMPM) payments. PMPM payments to providers or practices support PCMH models by providing funds for care coordination and non-visit-based patient management activities as well as investments in infrastructure necessary for PCMH implementation, such as EHRs. Some payers may make higher PMPM payments to PCMHs that are NCQA- or state-certified, or that have achieved a higher level of accreditation. In an approach that introduces a degree of provider risk, the PMPM payment under Iowa’s Medicaid PCMH program includes a 30% withhold that can be earned back if the PCMH meets specified performance standards related to quality and outcomes. States and other payers are also implementing a variety of P4P initiatives that reward providers for performance on quality measures or for complying with data submission requirements (“pay for reporting”). These no- and relatively low-risk payment approaches introduce performance-related goals to providers and organizations, which may be a first step on the payment reform continuum, toward shared savings and shared risk arrangements or global capitation. Shared savings. PCMHs and ACOs may enter into shared savings arrangements with payers. States and commercial payers often use the MSSP as a model. If a PCMH or ACO meets cost targets and quality thresholds, it may be eligible to share in any savings with the payer. If the arrangement also involves shared risk, the PCMH or ACO may be responsible for paying back a portion of the payments it received if its costs exceed the target. Episodes of care. A few states plan to implement episodes of care as part of their SIM initiatives. Episode-based payments can be prospective or retrospective. Under the prospective model, a single payment is made for all the services associated with a defined “episode of care.” Under the retrospective model, providers involved in the episode receive payment on a FFS basis, but total actual expenditures are subsequently reconciled against a pre-set price for the episode, which may trigger gain- or risk-sharing between the providers and the payer. Tennessee plans to implement 75 episodes of care within five years. The state is using a retrospective model, based on an assessment that providers can more feasibly implement it within the short timeframe and the fact that it does not require additional provider-level HIT infrastructure and data analytics capacity or changes in business relationships. Global capitation. Global capitation involves a single pre-set payment for a defined set of services delivered to an individual over a specified period of time. Global capitation payments are usually risk-adjusted and incorporate outcome and quality measures to guard against under-service and incentivize high performance. Relative to FFS and episode-based payment, which are both essentially volume-driven payment approaches, capitation payment models offer providers increased flexibility and may better support coordination with other providers, an activity that enhances patient care but is typically not reimbursable, and more integrated delivery of care. New York’s SIM project narrative states that global capitation is one of many methods it may use to support the Advanced Primary Care model it is pursuing. Colorado’s SIM narrative indicates that, down the line, the state may implement global or capitated payments to support comprehensive primary care services delivered by integrated practices. In addition to reforms in the way that care is organized, delivered, and paid for, patient engagement is an important theme in the SIM Model Test narratives. Educating patients about their conditions and engaging them in care-related decision-making is considered central to most PCMH and ACO models as a strategy for improving patient satisfaction, adherence to treatment plans, and health outcomes. As one illustration, in 2016, Washington plans to deploy maternity care decision aids and resources within its state health care programs. States are also developing consumer-oriented web-based tools and mobile applications to enable patients to obtain their health information more readily, and they are working to improve the transparency of information about provider costs and quality. New York, Washington, Connecticut, and other states are also pursuing demand-side approaches to influence consumer care-seeking behavior, such as value-based insurance design (VBID). Generally speaking, VBID usually involves structuring patient cost-sharing amounts for services in such a way as to encourage the use of high-value, effective services and drugs and discourage the use of ineffective or unnecessary services. More sophisticated forms of VBID may adjust cost-sharing based on individual patient characteristics, including diagnosis.4 As part of its SIM grant, New York is engaging the VBID Center at the University of Michigan to assist with the development and evaluation of VBID for targeted subpopulations of its state employees, including those with diabetes, hypertension, and asthma. Statewide delivery system and payment transformation requires robust health information technology (HIT) systems and analytic capacity. EHRs allow providers and organizations to capture patient data and report on clinical quality measures that are not included in claims data. State and local Health Information Exchanges (HIEs) facilitate information-sharing, which is necessary for care coordination across providers and clinical sites. All-payer claims databases can provide cost and utilization information that can guide health system planning and evaluation at the state, local, and provider level. States are using SIM grants to make strategic investments in HIT infrastructure to improve EHR interoperability, connect more providers to HIEs, and boost aggregation of data across payers and providers – also to strengthen the foundation for system transformation, increase capacity for data analytics, and permit measurement of progress toward population health and other goals . States are also using SIM funds to support HIT development for providers that may not be eligible for CMS Meaningful Use incentives, including behavioral health providers, long-term care providers, and home health agencies. The SIM program requires states to align quality and performance measures across payers, both to streamline requirements on providers and to more sharply focus performance improvement efforts. States are also linking provider-level measures to population health measures. States are engaging diverse stakeholders to develop core measure sets, often called “common scorecards,” frequently leveraging metrics that are already in wide use, including the Healthcare Effectiveness Data and Information Set (HEDIS) and measures developed or endorsed by the National Quality Forum (NQF), the federal Agency for Healthcare Research and Quality (AHRQ), and the U.S. Preventive Services Task Force, among others. Payers participating in states’ SIM initiatives will link their payments to provider performance on quality and cost metrics. Several states plan to develop payer and provider portals that will display performance dashboards, allowing providers to measure their performance relative to benchmarks and identify areas for improvement. States are carefully considering their legislative, regulatory, and other policy options for advancing and supporting health system transformation. For example, the SIM Round 2 states have outlined strategies to grow their primary care provider workforce, including changing medical school admission requirements and practices and scope-of-practice laws and regulations. States are also investing more in scholarship and loan forgiveness programs as a strategy to improve physician retention. In addition, they are working with academic institutions and continuing education entities to incorporate patient-centered, coordinated care models and other emerging models in their curricula. States are reviewing their Certificate of Need (CON) policies to ensure that they are aligned with SIM system transformation plans (e.g., to increase access to primary care), and they are monitoring provider consolidation as ACOs spread. States are also making changes to insurance oversight in ways that support value-based models. For example, Delaware has proposed certification standards for Qualified Health Plans that include requiring new provider payment models such as P4P and shared savings. State innovation in health care delivery and payment long pre-dates the SIM initiative. But SIM provides a vehicle for building on and spreading that innovation by funding multi-payer strategic planning, system-level capacity-building, and development, testing, and evaluation of new models. It may be that, compared to other states, states that adopted the ACA Medicaid expansion were also better poised or inclined to undertake other, broader health system reform efforts; it is notable that, of the 11 Model Test states funded under SIM Round 2, nine have implemented the Medicaid expansion. The SIM narratives highlight several delivery system and payment reforms that states are undertaking specifically within their Medicaid programs. States report requiring Medicaid MCOs to participate in statewide PCMH and/or episode of care initiatives and to adopt value-based provider payment methods. Connecticut is establishing a Medicaid Shared Savings Program under its SIM initiative. Washington plans to centralize Medicaid purchasing for physical and behavioral health services at the county or multi-county level, on the premise that a regionalized approach will enable the state to better coordinate the delivery of health, social, and community services, and public health, by improving linkages and increasing accountability for health outcomes at the regional level. By 2020, the regions will have a single benefit package that includes physical health, mental health, and chemical dependency services, and the vast majority of Medicaid beneficiaries will be in fully integrated managed care plans that provide the complete package. Washington also plans to introduce a value-based Medicaid payment method for federally qualified health centers and rural health centers that will support innovations in care delivery already taking place in these sites; the project narrative notes that the health centers strongly back the new approach. The aims of the SIM initiative are high – to transform health care delivery, improve population health, and decrease per capita health care spending. Under SIM, states are trying to pioneer new care and payment models and other SIM elements in their Medicaid and state employee health programs first. Commonalities are apparent across state SIM approaches, but so are differences, reflecting unique state characteristics, resources, and challenges. Rigorous evaluation of the implementation and impact of the SIM models and specific state approaches will be important to guide continuing state and federal efforts to improve our health care system and the health of all Americans.